Standard sink. Good value. I expect that it will be fine in my bathroom remodel. 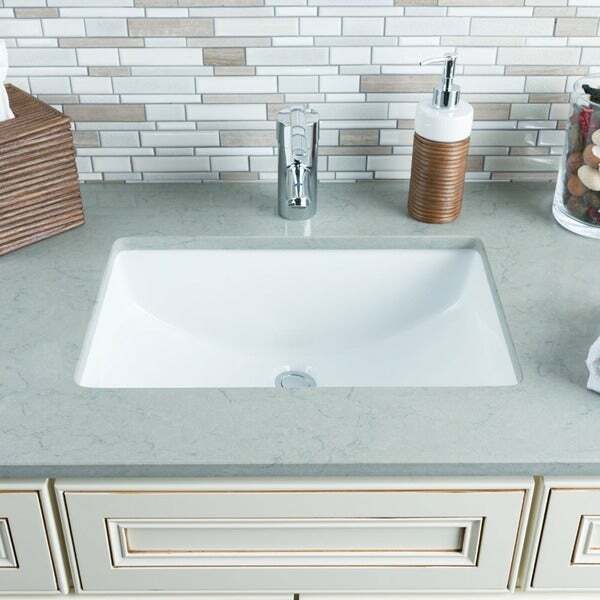 Rethink your concept of a bathroom sink with this deep undermount bowl that offers sloped sides and an expansive rectangular shape. Made of white ceramic and porcelain, this exceptional sink bowl easily integrates with existing tub enclosure and bath decor themes. This sink was the perfect addition to our remodeled bathroom. I actually purchased two for his/her vanities and couldn't be happier. Although the size is perfect for us, I do think that "Large" in the name is deceiving. Be sure to check your measurements. This sink really isn't THAT large. Purchased 2 for my master bathroom. Good qualtiy porcelain and pitch of sink is excellent for drainage. No water sits in the sink. The size and shape is very for a very updated look. Good value for the cost. Rectangular undermount gives a sleek and modern appearance. This a great oversized bowl for a single vanity in my master bathroom. Looks very hotel chic. Bright white and doesn't absorb stains so far. This is a great product. I too was worried about it being "large", but hoped the previous review was truthful, and it was. These are not large. They're normal. I'm thinking the others must be pretty small. I took measurements of our old sinks and this large one is the pretty much the same. It may be a touch deeper than our previous ones, but I'd totally recommend it. I bought three of these when I remodeled my last house a year ago. Just move in to my new house and installed two of them. Love the rectangular shape and sloped left and right sides. Highly recommend these sinks. This purchase was a good move. The color is as shown. 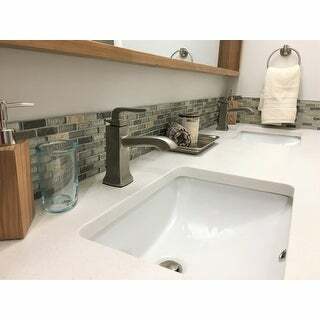 After making this purchase on overstock we saw the same sink available for double, from the store that we bought our granite counter from. (This is an under mount sink and needs to be on hand for the CT fabricator to cut the CTs.) The quality is very good; it holds up well to cleaning and regular use. Overall quality appearance. Good depth to minimize splashes. Wish the metal piece on the overflow were available in other finishes. The finish is shiny chrome like, but not too noticable because of location and small size. We have had it for about 6 months or more. Love this sink! Ordered one for each bathroom. Great price and it's beautiful. Remodeling both bathrooms. I like these sinks. I bought four of them, two for the master and now each for the other two baths. I wanted a bigger sink, these are the size I was looking for. I had read a review where someone received a broken sink via transit which I am sure could happen, but not in my case all four sinks arrived without incident. Nice sinks. Good quality. Recommended. I bought 6 of these sinks. Two for my master bath, and one for each of the other 4 bathrooms in my house. They are nice and deep. They have a great look to them. I have them all under mounted under quartz and they look amazing. Only have had them installed for a few weeks but love then so far. Highly recommend for the money. Excellent sinks. They do their job nicely. Great sink. Easy to clean. Although 1 of the 3 sinks I ordered came damaged, Overstock always is dutiful and prompt to replace it without fail. This is the 2nd bulk purchase of this sink and it has worked well in our other rehabs. Sturdy, good quality and very attractive for the price. Would purchase again. Installed this sink in a quartz counter in the master bath of a spec home. The realtors are all complaining of only one sink in this master, but no room for two sinks. Looks wonderful, very tasteful and stylish. Would recommend to all. Great value for t(e price. "Based on previous questions: Is this sink white or cream (less stark white)?" "What does the overflow look like?" "Would the large size fit a 35' cabinet? Anita T"
"You suggested 16052483 for a white, white. I am looking for a more shallow, sleek line sink in white, white. The number you suggested has too sharp lines. Do you have any shallower, rectangler sinks in white, white?" "Do you have a PMS color for the white. I am looking for a white white"
We do offer item# 16052483 that might work for you. "Does this sink have an overflow drain? Two previous answers contradict each other. One response says yes and the other says no." The 6 I bought have round over flows across from the faucets. They are plastic painted chrome but look nice. You would never know they were not metal unless you pulled it out.